Our mission at Service Stampings is to make the process of ordering stampings easy, straightforward, and affordable. We are able to do that thanks to a streamlined communication system that allows you to speak directly to decision makers who are empowered to move your project forward with no delays or red tape. With our goal to always have long-term customers who return to Service Stampings again and again, we are always seeking the most cost-effective solutions that will give you the desired result at an affordable price. All proposals include critical information provided from our engineering department to assure that quality and cost requirements are met. Once prepared, proposals are sent in a timely manner. Successful projects begin with proper planning. Service Stampings’ sales and engineering professionals will provide you with creative ideas and applied expertise gained from over fifty years of providing stamping, fabrication, and assembly services. Our experience can help you achieve both your quality and cost requirements. 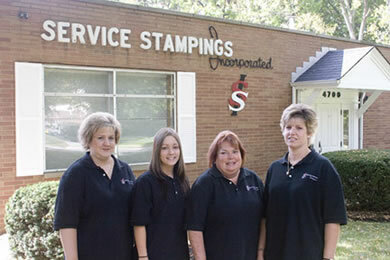 Service Stampings can quickly provide you the order information you need. From order updates to delivery dates, we will help you stay current on all of your important project details. "Quick turn-around" and "rush deliveries" are welcome words at Service Stampings. In a world of just-in-time (JIT) deliveries, Kanban programs, and accelerated project schedules, Service Stampings can provide the prompt services needed to keep your project on schedule.